Mechanized Men of Mars is an adventure by Thomas Denmark for Warriors of the Red Planet, an OD&D inspired sword & planet game that I really liked. Unfortunately, Mechanized Men of Mars doesn't live up to that standard. It sells for $2.99 at DTRPG/RPGNow and is a single column PDF of 32 pages. Seven of those pages are taken up with titles, credits, and legal stuff. Another five pages details the background of the adventure, though it can be summed up as basically a mad scientist who can turn people into machine soldiers has returned from the dead (sort of) and the PCs must stop him. What follows is the adventure. Or perhaps more accurately, notes on making an adventure on this premise. Rather being being purely a site based adventure, it's more of a plot driven adventure. 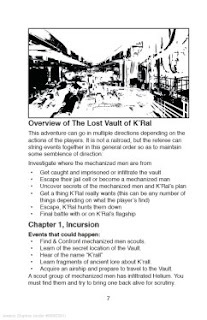 The mechanical men make a raid on the city the PCs are in, they are sent to infiltrate their base, they presumably get captured, they escape somehow and get on the villain's airship and I guess presumably there kill him. Unfortunately, you aren't given any details on that. 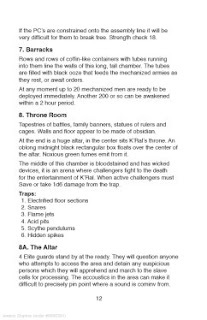 Just an outline of what the adventure should (or perhaps could) be. 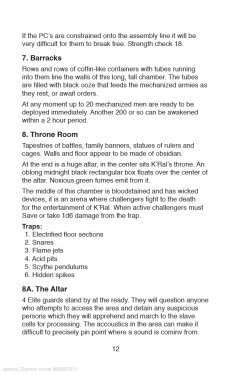 What you do get is a description of the base, which consists of 12 rooms, most of which are empty, then a short two paragraph description of the villain's airship. Next comes 6 pages of stats, detailing 3 types of mechanical men, the villain (in both original and current form), and his general. Then comes day and night encounter tables for the city of Helium (which is presumably the PC's base) and the wilderness surrounding it. I'm guessing there is an error here because all three tables are identical. Lastly, we get a number of maps. Firstly, a really nice hexmap of the area involved. Rather than the usual Hexographer fare, it looks handdrawn. Next an unkeyed map of some of Helium's buildings and then a two page map of the stronghold which shows some fine detail in some rooms, but just white space in others. Lastly is a map of two decks of the villain's skyship, which isn't labeled (or keyed) save for one entry, The Wheelhouse. There's a handful of original art, but nothing as striking as the cover. One great thing is that the PDF defaults to "Single Page", not "Single Page Continuous" like most PDFs and which drives me crazy in the few seconds before I can switch it to "Single Page"
Maybe it's just me, but I buy adventures to get something I can run out of the box (more or less), not something that requires me to flesh it out. Partly out of laziness, but also because I like get getting a different perspective on things than what I usually come up with. I can get stuck in a rut. F1, Move: 90’, SA: none)". For NPCs, I really like having ability scores. And despite a disclaimer in the text, it really is something of a railroad. I realize that many of the original Barsoom books follow a similar plot, where a menace face Helium, then John Carter (who his children) go to investigate, get captured, find a way to escape and ultimately defeat the villain while fleeing. But gaming is not a novel and trying to force gameplay to mimic a novel is bad. It's worth a buy if you are a fan of Martian gaming and/or Warriors of the Red Planet, but probably not for anyone else. Perhaps & hopefully, they will run a Kickstarter later on to enhance this game module with more artwork, encounters & whatever else !